I use organic cotton, always organic cotton, for a variety of textiles - household and wearables. Its soft and washable nature make a great base for washcloths, baby blankets and multi purpose cloths, not to mention that cotton is easy to dye, absorbing up colours from plants just like the thirsty plant that it is. The growth of cotton is responsible for no less than 15% of the worlds pesticide use and 77% of crops are irrigated. Given the state of the worlds waters and earth paired with my desire to take responsibility for my relationships with plant, land and animal life, I go for Global Organic Textile Standard (GOTS) certified organic cotton. GOTS standards, although, in my own opinion, are still working out kinks, but nonetheless sets social, technical quality and environmental as well as toxicity criteria for every step of the textile process and supply chain from farming to process and manufacturing. Structure of cotton. Photo sourced through Google search. Natural fibres can be basically categorized into two groups - cellulose and protein based. There are great virtues to both, each fulfilling a large swath of purposes, indeed, able to satisfy most purposes we have for day to day textiles here on earth. Cotton, being of cellulosic nature possess something that proteins, by nature, do not and cannot produce. That is, a cell wall within their cellular make up. A plants cell wall provides structure and tensile strength - something for which linen and hemp are well regarded. A cotton polymer is quite long and contains a countless number of hydrogen bonds between these polymers, details also contributing to cottons integrity. As with other plant fibres, cotton is quite unyielding; that is, it just isn’t very stretchy! Animal fibres generally have more elastic ability than plants. 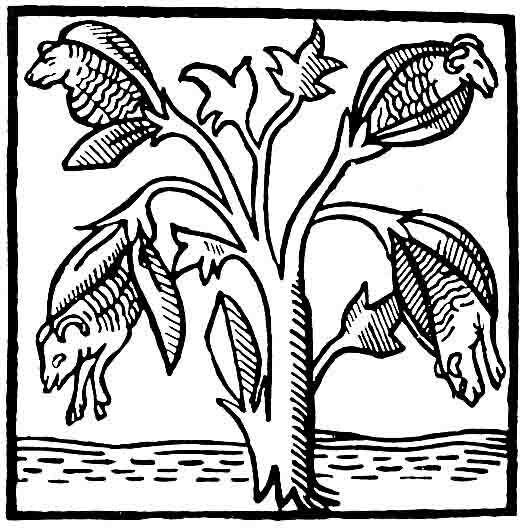 Interestingly, during early civilization of European humankind, the general thought was that cotton was a type of ‘tree wool’ and that cotton branches, with their tiny lambs attached, stooped down in the breeze to browse on grasses on the ground below. These fictitious little lambs died when they ran out nearby food or, of course, if a wolf found them first. This was a common European knowledge from the 13th until the 17th centuries. John Mandeville's and Friar Odoric 1350 ad. - 1360 ad. description. Photo sourced through google search. Cotton, of the mallow family and gossypium genus, is the most popular natural fibre on the planet, between 20 and 30 million tonnes of it are produced every year worldwide (remember here that 15% of the worlds pesticide use is applied to cotton). And yet, as of 2015/2016 only 0.5% of the worlds fibre was certifiably organic. The fibre is grown all over the world, organically and conventionally. Most of the worlds organic cotton is grown in India, Syria, Turkey, China, Tanzania, the USA, Uganda, Peru, Egypt, Burkina Faso and Kyrgyzstan. Cotton is a tropical plant thriving in temperate, tropical and sub tropical zones around the world; the plant requires a long growing season lacking frost and temperatures between 18 and 30 degrees celsius in an area that receives at least 500 mm of water between the point of germination and boll formation. The plant itself is visually interesting, a tall plant that could be gangly when aged and ripe if it weren’t for the soft cotton bolls covering it’s woody stalks; the flowers that come before the bolls are, by sight, comparable to a hibiscus, the stems are covered in ample and verdant three pointed leaves. Although cotton is most often grown uncoloured, the boll matured into recognizable white fluff, it can be grown in assorted colours - green, brick red and various shades of brown. Cotton, although used and appreciated the world over, plays a role in a dark history; when cotton was recognized as the first mass consumer commodity in the USA around the time of the innovation of the cotton ginny, the abuse of human labour and the slave trade was in turn, strongly intensified. An enormous topic of discussion that I won’t be covering now but must be, at the very least, mentioned. Cotton, like all natural fibres, is biodegradable; it is also non-allergenic, absorbent, soft and breathable, it cannot hold an electric charge so, lucky for cotton wearers, it won’t cling in dry atmospheres. Like linen and hemp, cotton is stronger when it is wet. This is due to the hygroscopic nature of cotton: the polarized -OH groups found within the polymer structure of the fibre will attract water molecules, these water molecules then infuse the amorphous region (as opposed to the crystalline region) of the cotton polymer and temporarily improves the polymer alignment due to the additional hydrogen bonds (recall, cotton polymers already contain countless hydrogen bonds that contribute to the tensile strength of the fibre). I could continue. Needless to say, cotton is a useful plant. When it comes to cellulose fibres, the length rather than the diameter (micron count) of the fibre is what really counts. This is referred to as the ‘length-to-breadth ratio’. The highest quality cotton has a 6000:1 ratio and lower quality comes in at 350:1. Cotton is classified into short, long and extra long staple length. The long and extra long classes encompass the luxury varieties of cotton (Pima and Egyptian, although beware, much of the cotton labelled as Egyptian isn’t necessarily grown in the traditional cotton growing Nile River Valley.) Whereas the short staple cotton, typically used commercially for every day goods, encompass a number of cotton species including Acala cotton which comes only from California. Interestingly, cotton has the ability to conduct heat, meaning it can withstand many household high temperature situations (think, hot wash water, ironing, we’ve all used a kitchen towel to take something out of the oven!). Having said that, prolonged exposure will cause the fibre to char and burn - when it does burn it smells of burning paper and produces a white ash (fibre identification tip!). Being a natural material and bio-degradable, cotton will form mildew if left in a warm, moist environment but is not attractive to clothes moths or other insects. The fibre will disintegrate if left for extended periods in strong sunlight and is weakened by acids while being resistant to alkalis.